Why do we look the way we do? What does the human hand have in common with the wing of a fly? Are breasts, sweat glands, and scales connected in some way? To better understand the inner workings of our bodies and to trace the origins of many of today's most common diseases, we have to turn to unexpected sources: worms, flies, and even fish.Neil Shubin, a leading paleontologist and professor of anatomy who discovered Tiktaalik--the "missing link" that made headlines around the world in April 2006--tells the story of evolution by tracing the organs of the human body back millions of years, long before the first creatures walked the earth. By examining fossils and DNA, Shubin shows us that our hands actually resemble fish fins, our head is organized like that of a long-extinct jawless fish, and major parts of our genome look and function like those of worms and bacteria.Shubin makes us see ourselves and our world in a completely new light. 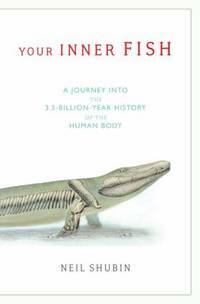 Your Inner Fish is science writing at its finest--enlightening, accessible, and told with irresistible enthusiasm.From the Hardcover edition. Knopf Doubleday Publishing Group, 2008. Hardcover. Good. Disclaimer:A copy that has been read, but remains in clean condition. All pages are intact, and the cover is intact. The spine may show signs of wear. Pages can include limited notes and highlighting, and the copy can include previous owner inscriptions. The dust jacket is missing. At ThriftBooks, our motto is: Read More, Spend Less. Knopf Doubleday Publishing Group, 2008. Hardcover. As New. Disclaimer:An apparently unread copy in perfect condition. Dust cover is intact; pages are clean and are not marred by notes or folds of any kind. At ThriftBooks, our motto is: Read More, Spend Less.Dust jacket quality is not guaranteed. Knopf Doubleday Publishing Group, 2008. Hardcover. Good. Disclaimer:A copy that has been read, but remains in clean condition. All pages are intact, and the cover is intact. The spine may show signs of wear. Pages can include limited notes and highlighting, and the copy can include previous owner inscriptions. At ThriftBooks, our motto is: Read More, Spend Less.Dust jacket quality is not guaranteed. Knopf Doubleday Publishing Group, 2008. Hardcover. Very Good. Disclaimer:A copy that has been read, but remains in excellent condition. Pages are intact and are not marred by notes or highlighting, but may contain a neat previous owner name. The spine remains undamaged. At ThriftBooks, our motto is: Read More, Spend Less.Dust jacket quality is not guaranteed. Pantheon. Used - Good. All orders guaranteed and ship within 24 hours. Your purchase supports More Than Words, a nonprofit job training program for youth, empowering youth to take charge of their lives by taking charge of a business. Pantheon. Used - Good. Shows some signs of wear, and may have some markings on the inside. Pantheon. Used - Very Good. Former Library book. Great condition for a used book! Minimal wear. Pantheon, 2008-01-15. Hardcover. Very Good. Hardcover with dust jacket. Pages are clean and unmarked. Covers show very minor shelving wear. Binding is tight, hinges strong. Dust jacket shows light edge wear. ; 100% Satisfaction Guaranteed! Ships same or next business day! Pantheon, 2008-01-15. Hardcover. Very Good. First edition" Dust jacket included and in very good condition.No writing, highlighting, or marks in text. Looks giftable. Pantheon. Used - Very Good. Huge Hardcover with DJ. Very good condition; edges, corners, and covers of book show minor wear. No underlining; no highlighting; no internal markings. DJ is Very Good; light edgewear. Like new but for a small pale stain on the botton right corner of the pages. Stored in sealed plastic protection. In the event of a problem we guarantee full refund. 2008. Huge Hardcover with DJ. Pantheon, 2008-01-15. First. Hardcover. Used:Good. Pantheon. Hardcover. 0375424474 Like New Condition. . Fine. Pantheon. Hardcover. 0375424474 New Condition *** Right Off the Shelf | Ships within 2 Business Days ~~~ Customer Service Is Our Top Priority! - Thank you for LOOKING :-) . New.